It is difficult to explain this drawing. It shows the church without any sign of wear and tear such as the tumble down tower seen in drawing . 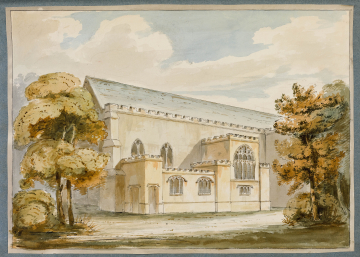 If it shows the north front then the new work might consist of a new family pew that replaced the north aisle of the church which collapsed in 1802. (P.Dean, Sir John Soane and the country estate, 1999, p.104).